Injection molding is one of the most commonly-used plastic part manufacturing processes. It is suitable for production of parts from both thermoplastic and thermoset polymers. Typically the first step is for plastic pellets or granules to be heated into the molten state. 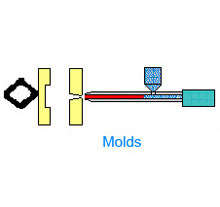 The melted plastic is then injected into a chamber which is the interior of a split-die mold. If the material is thermoplastic polymer the molten plastic is chilled for the purpose of solidification; if the material is thermoset polymer the molten plastic is heated to cause curing. The mold is then opened and the part is ejected. Though its tooling costs are relatively high, injection molding is the most widely-used manufacturing process for plastic materials in mass production. Its advantages are low operationing cost, high throughput, and the ability to make parts of complex shapes.